The east-west train service across Suffolk is better than it was, but I’ve just read in a Network Rail study entitled Improving Connectivity, about a radical proposal to greatly improve services. At present at Ipswich station, in addition to the main line services, there are hourly services to Cambridge, Felixstowe and Lowestoft, with a two-hourly service to Peterborough. From a passenger point of view it is not good at times. In the past I have been irked by. Trying to get between Newmarket and Felixstowe, which often means a not very short wait on Ipswich station. The lack of a late night train back to Newmarket from Ipswich. Bad connectivity between London services and the various branches. It may be better now and some of the proposals in the latest franchise documents will certainly help. One document I’ve read, talked about direct services between London and Lowestoft. When I moved to Suffolk in the 1970s, this route was served a couple of times a day. But one proposal in the Network Rail study must be taken seriously. The study proposes creating an island platform at an updated Newmarket station and running a direct service between Newmarket and Peterborough via Ely. The study describes the proposal like this. To solve this dilemma, The direct Ipswich to Peterborough service is replaced by a Newmarket to Peterborough service, running via a reinstated Warren Hill Junction – Snailwell Junction chord, as shown in Figure 3.2. A semi-fast Ipswich to Cambridge train connects into this service with a cross-platform connection at a reconstructed Newmarket station. No services are duplicated and connections at Ipswich are simplified: the East Suffolk line arrival need only connect with the Cambridge train. This method of operation combines two markets on one train, achieving a 35 per cent reduction in train miles and halving the number of passenger train paths required on this busy freight corridor. In addition, Newmarket gains a direct service to Peterborough. So one new short chord and a reconstructed Newmarket station, dramatically improve the passenger train services across Suffolk, whilst giving more much-needed space in the schedules for freight trains. This map shows the area between Newmarket station and Warren Hill – Snailwell. Note that the line through Newmarket station goes in a tunnel under the training grounds of Warren Hill before turning to the East to connect to Bury St. Edmunds and Ipswich. The new chord would connect between the Newmarket to Bury Line and the Ely to Bury Line. Hopefully, Network Rail has safeguarded the route and hasn’t sold the land to some, who would oppose the plan. If I read Network Rail’s proposal correctly, there would be an hourly Newmarket to Peterborough service, which would provide a cross-platform interchange with an hourly semi-fast Ipswich to Cambridge service. Given that Abellio Greater Anglia were part of the IPEMU tests between Manningtree and Harwich, I suspect that both the Peterborough to Newmarket and Ipswich to Cambridge services would be run with four-car IPEMUs. In my view it is a very good starting plan, but it does raise a few questions and interesting possibilities. IPEMUs would be faster than the current diesel trains and would also offer an increase in capacity. Would IPEMUs take over the Cambridge to Norwich, Ipswich to Lowestoft and Ipswich to Felixstowe services? Newmarket racecourse is an incredibly popular venue and the current Newmarket station has inadequate capacity for racegoers. More four-car IPEMU trains from Cambridge, Ipswich, Ely and Peterborough calling at the station can only increase total capacity. As now, I suspect a shuttle bus will be provided, between station and racecourse. A simple one-platform Newmarket Racecourse station could even be built on land owned by the Jockey Club on the single-line section of line to the West of the town, which would be about a kilometre walk from both racecourses. Cambridgeshire County Council have had plans for a long time to reopen Soham station. This would be on the hourly Newmarket to Peterborough service, which would men that with one change you could be in Cambridge or Ipswich. If Soham is worth reopening, why not reopen Fordham station. 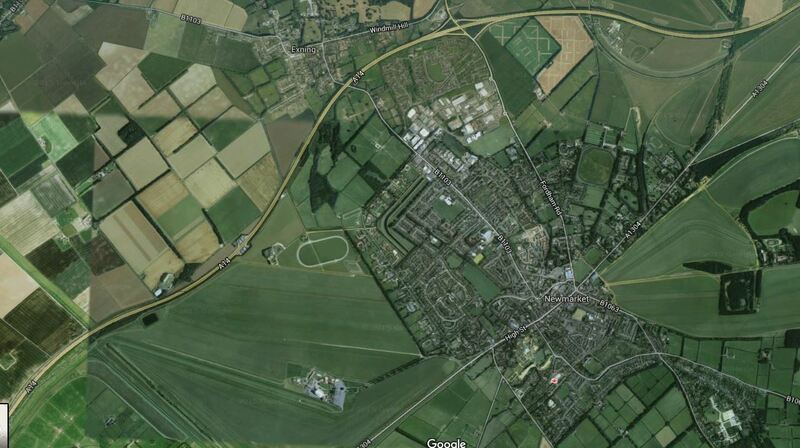 How would the new station at Cambridge North fit in and affect services in the area? I think that when and if the full proposals arrive, they will have some extra features. An uprated service from Cambridge to Ipswich will require some reorganisation at Ipswich. Over the last few years, freight traffic through Ipswich station has eased due to ther opening of the Bacon Factory Chord which allows diesel-hauled freight trains to go directly between the Felixstowe branch and the Midlands and North via Stowmarket. The Newmarket reorganisation will also release extra paths through Ely and Peterborough and there could be scope for improving the efficiency of Ipswich station. Given that services will arrive from and leave to Cambridge, Lowestoft and Felixstowe, every hour. Surely, a platform layout could be found, so that they all used the same part of the station and passengers just walked across. Imagine the benefits to passengers if say you were going between Beccles and Peterborough and you just walked across between trains at Ipswich and Newmarket. I suspect that Network Rail and Abellio have an excellent idea for Ipswich station, filed under Cunning Plans. Would it also be worth improving patterns at Ely? 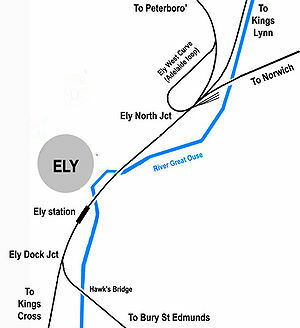 This Google Map is from Railways in Ely in Wikpedia. It is complicated. These are my thoughts. The layout would appear to work quite well now,but will it cope with Cambridge North station? Cambridge North station will probably generate a lot of traffic and with some reorganisation, passengers might even be able to walk across or just wait for the next train at Cambridge or Ely, to be on their way. But in some cases, changing will mean climbing over the bridge at Cambridge or using the subway at Ely. Ely station should cope with any extra services on the lines to Ely and Norwich. There is also the issue of a possible Wisbech branch at March. So will we see changes to the track layout at Ely? But upgrading Ely does throw up one important question. When the Cambridge Guided Busway was built, I didn’t think it was the best solution, but I had no real idea what would have been best. I now wonder, if the ideal transport system for the route of the Cambridge Busway has arrived in the form of the tram-train! If you look at the route from Huntingdon through Cambridge to Addenbrookes, it’s very much linked to the railway lines through the city. Most of the extensions proposed for the busway could be performed by tram-trains in tram mode. One proposal from Huntingdon to Peterborough, is typical of many systems, I’ve seen in Germany. But it is too late now to change that decision. One thing though that surprises me, is the amount of undeveloped land there is on either side of the railway line, where the Cambridge North station is being built. It could be possible to create a a tram line to connect Cambridge North station to the Cambridge to Ipswich Line. Thus tram-trains could go from both Cambridge North and Cambridge stations to Newmarket and then on past Fordham and Soham to Ely, where with a short chord they could turn south to the Cambridge stations. Obviously, a real route would be based on the proposed developments and passenger traffic, but there are a lot of possibilities to use tram-trains to serve the towns and villages around Cambridge from the existing heavy rail lines. At the Southern end, how about Shelford to Haverhill and onto Sudbury to then take the Gainsborough Line to Marks Tey? I suspect that a single-track tram with passing places could handle tram-trains on a route not far removed from the route of the old Stour Valley Railway. A lot of serious thinking can be done!